Our highest quality offerings encompass the broadcasting services value chain including teleport, production, satellite, fiber and others. Constantly leveraging advances in technology, we manage, aggregate and transport content for broadcasters and networks to audiences using the most effective solution for all your broadcasting needs. 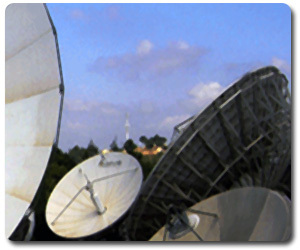 TV Channel Distribution: Reach your desired audience over satellite, fiber networks and IP. Occasional Use Services: our sophisticated earth stations infrastructure in a strategic location enable effective distribution of News, Sports and Special Events. Play Out Facilities: Fully managed Playout & remote Playout systems, Encryption Services, Promo & Advertising Insertion and Channel Time Delay. State-of-the-art teleport facilities: Advanced digital Master Control Room (MCR) for High Definition (HD) and Standard Definition (SD) transmission services, and HD and SD production services. IPTV, Web Streaming and Media Analysis: Digital IP transmission infrastructure delivers IPTV and Web Streaming around the world. With 24/7 added value automated, remote content media analysis tools, broadcasters can analyze their channels’ content alongside those of their competition.